Most homes contain heating and air conditioning systems that consist of duct work that connects the furnace to different rooms in the house. Register vents are the grates that cover the wall opening where these ducts come into the room. Dampers are usually attached to the back of these registers which open or close to allow just the right amount of airflow into a room. They are both a functional and decorative addition to a living space and can be found in various materials such as wood, brass, or cast iron. Register units are common in homes that contain forced air systems. A fan will push air through the ducts that run throughout the house. They are meant to protect the duct from trapping loose items as well as to properly adjust the flow of air. Since ducts can enter a room from different areas, there are a number of sizes, shapes, and kinds to choose from. Wall registers are usually screwed into place while floor registers are set in place with no permanent attachment. Baseboard registers normally have a grill on the front and are triangular shaped. Registers can be plain or extremely fancy. Victorian homes often contain vents with ornate patterns while ordinary houses come with plain vents. The register vents must work properly to sure correct airflow. They should not be covered by curtains, furniture, or dust. It is vital to maintain and clean these registers on a regular basis and make sure that they are properly balanced around the house. To properly balance heat registers a person must make sure each register is in the unwrap position and free from all obstructions. Next, a person must recognize areas of the home that are not being heated evenly. After turning on the heat, it is essential to note rooms that are overly warm or too cold. When this is uncovered, vents can be closed in rooms that are too hot. Finally, it is important to assess the performance of the heater. After the heat runs, it must be noted whether or not the changes made any difference and corrected the problem of uneven heating. 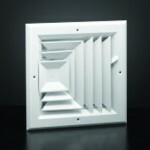 When searching for effective register vents, it is important to purchase high quality products. Companies like FAMCO have been in the ventilation business for years and always manufacture products that are built to last and work with high efficiency. They offer a number of styles and are available to give recommendations on specific products for individual situations.